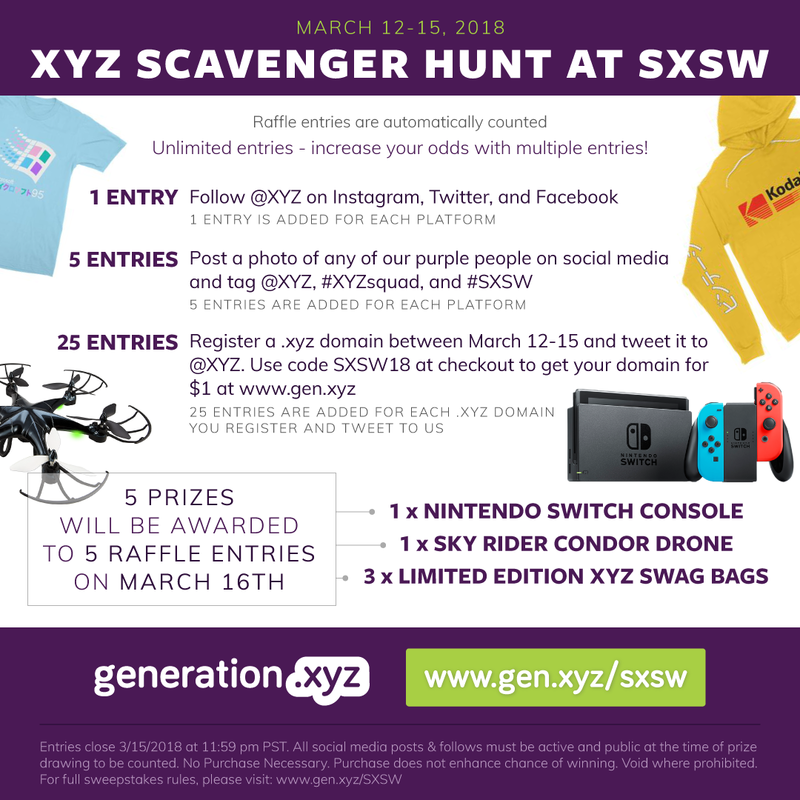 XYZ Scavenger Hunt at SXSW 2018! ENTRY IN THIS SWEEPSTAKES CONSTITUTES YOUR ACCEPTANCE OF THESE TERMS AND CONDITIONS. A PURCHASE OF ANY KIND WILL NOT INCREASE YOUR CHANCES OF WINNING A PRIZE. (b) a resident of the United States. (a) employees of Gen.XYZ and its parent company, affiliates, subsidiaries, advertising, promotion, fulfillment or other coordinating agencies, individuals providing services to Gen.XYZ through an outsourcer or temporary employment agency during the Sweepstakes Period (defined below), and their respective immediate family and persons living in their same household (as the case may be). You may send a piece of paper with your name, email address, address, phone number, and date of birth to “SXSW Sweepstakes Entry, 2800 OLYMPIC BLVD., #100, SANTA MONICA, CA 90404.” Each entry received this way will be considered equivalent to entering via method 3 above and will have an equal chance of winning a prize. In order for your mail-in entry to be eligible for the sweepstakes, your letter must be actually received by Gen.XYZ within the Submission Period. Winners will be chosen at random among the eligible Entrants that entered the sweepstakes. The odds of winning a prize depend on the total number of complete entries received. No cash or other substitution of prizes is permitted, except at the sole option of Gen.XYZ for a prize of equal or greater value. Gen.XYZ will not replace any lost or stolen prizes. Winners are solely responsible for any and all federal, state, provincial and local taxes, if any, that apply to prizes. If a prize is mailed, the winner assumes the risk of the prize’s safe arrival. Prizes are offered “as is” with no written, express, or implied warranty. Winners will be notified by e-mail or social media within ten (10) business days of the prize determination, and may be required to sign and return an affidavit of eligibility and publicity/liability release within seven (7) days of notification. If a selected winner cannot be contacted, is ineligible, fails to claim a prize and/or where applicable an affidavit of eligibility and publicity/liability release is not timely received, is incomplete or modified, the prize may be forfeited and an alternate winner selected from remaining valid, eligible entries timely submitted. Allow 6 to 8 weeks for delivery of prizes. By submitting the Sweepstakes Entry, the Entrant shall be deemed to have read, understood, accepted and agree to be bound by these Terms and Conditions. You understand that the outcome of the Sweepstakes, and Gen.XYZ’s decisions about the Sweepstakes shall be final. By submitting an entry, you agree to absolutely and completely comply with all laws, rules and regulations applicable to your participation in the Sweepstakes. Submission of the Sweepstakes Entry does not guarantee the Entrant the opportunity to participate in the Sweepstakes. Gen.XYZ is entitled to reject or refuse participation by the Entrants for reasons, including (without limitation) where the Sweepstakes Entry is not complete or any provisions in the Terms and Conditions is not fulfilled or adhered to by the Entrant. No mechanically reproduced mail-in entries are allowed and any use of robotic, automatic, programmed or the like entry methods will void all such entries by such methods. Gen.XYZ is not responsible for (i) late, lost, illegible, misdirected, damaged, incomplete, improperly submitted, undeliverable or otherwise irregular Sweepstakes entries; (ii) theft, destruction, unauthorized access to or alterations of entry materials; or (iii) phone, electrical, network, computer, hardware, software program or transmission malfunctions, failures or difficulties. (e) will not subject Gen.XYZ to any form of liability or prejudice whatsoever. Submission of an entry constitutes each entrant’s certification that the entry is entrant’s own original work. By submitting any entry, entrant hereby grants Gen.XYZ and its successors and assigns a perpetual, irrevocable, worldwide, non-exclusive, royalty-free, sub-licensable (through multiple tiers) and transferable license to use, copy, transmit or otherwise distribute, perform, modify, create derivative works based upon, incorporate into other works, publicly perform and display the entry or any portion thereof, in or through any medium, whether now known or hereafter created in any manner without further compensation during or after the Sweepstakes Period. Nothing herein shall constitute an employment, joint venture, or partnership relationship between entrant and Gen.XYZ. In the event of any dispute, an online Sweepstakes entry is deemed submitted by the registered internet or e-mail account holder associated with such entry. In all other cases, the Sweepstakes entry is deemed submitted by the name indicated thereon. Satisfactory proof of association shall be furnished to Gen.XYZ without fail. Except where prohibited, by participating in the Sweepstakes and/or winning any prize, entrant consents to the use of his/her name, photo and/or likeness, biographical information, entry and statements attributed to entrant (if true) for advertising and promotional purposes, including without limitation, inclusion in Gen.XYZ’s newsletters and Gen.XYZ’s web domain at http://gen.xyz, without additional compensation. See the section on “Personal Information”. All entries become property of Gen.XYZ and none will be acknowledged or returned. The Sweepstakes will begin on 3/12/2018 at 12:00 a.m. Pacific Time and ends on 3/15/2018 at 11:59 pm PT (the “Sweepstakes Period”). Awards for each period will be announced on 3/16/2018 within one month of the end of each submission period. Winners will be contacted via phone or email prior to award announcement with more information. Entries submitted outside the Sweepstakes period will not be considered. Gen.XYZ reserves the right to vary, postpone or re-schedule the dates of the Sweepstakes or extend the Sweepstakes Period at its sole discretion. Each entry must not contain: (i) material that violates or infringes upon another entities or individual’s rights, including but not limited to privacy or intellectual property rights. This includes any trademark, patent, or copyright infringement; (ii) material that promotes racism, hatred, discrimination, or harm against any individual or group; or (iii) material that is unlawful or in violation of applicable federal and state laws. Gen.XYZ reserves the right, at any time, to verify the validity of claims and the eligibility of entrants (including an entrant’s identity, age and place of residence) and to disqualify any claimant who submits an entry that is not in accordance with the spirit of these Rules or who tampers with the entry process, or who fails to provide the required information to claim a Prize. Failure by Gen.XYZ to enforce any of its rights at any stage does not constitute a waiver of those rights. Gen.XYZ may refuse to award a prize to any person, for any reason, including any violation of these Rules. Gen.XYZ may disqualify, in its sole discretion, any Entrant, which Gen.XYZ believes has violated or failed to conform to these Rules. (c) Gen.XYZ disclaims all responsibility for any harm resulting from entrant’s access to or use of a Third Party Website. Gen.XYZ assumes no responsibility for any error, omission, interruption, deletion, defect, delay in operation or transmission, communications line failure, theft or destruction, unauthorized access to or alteration of entries, or any problem or technical malfunctions of any telephone network or line, computer online systems, servers, or providers, computer equipment, software, failure of any online Sweepstakes entry to be received on account of technical problems or traffic congestion on the Internet or at any website (including a Third Party Website), or any combination thereof, which may limit an entrant’s ability to participate in the Sweepstakes. ANY ATTEMPT BY AN ENTRANT OR ANY THIRD PARTY TO CIRCUMVENT, TAMPER, DISRUPT OR DAMAGE THE SWEEPSTAKES ENTRY PROCESS, GEN.XYZ WEBSITE OR TELEPHONE SYSTEMS, DEFRAUD OR GAIN AN UNFAIR ADVANTAGE, ENGAGE IN UNSPORTSMANLIKE, DISRUPTIVE, ANNOYING, HARASSING OR THREATENING CONDUCT, OR OTHERWISE UNDERMINE THE FAIRNESS, INTEGRITY AND LEGITIMATE OPERATION OF THE SWEEPSTAKES, WILL RESULT IN AUTOMATIC DISQUALIFICATION FROM THE SWEEPSTAKES AND MAY CONSTITUTE A VIOLATION OF CRIMINAL AND CIVIL LAWS. GEN.XYZ RESERVES ALL RIGHTS, INCLUDING THE RIGHT TO SEEK REMEDIES AND DAMAGES (INCLUDING ATTORNEYS’ FEES), TO THE FULLEST EXTENT OF THE LAW, INCLUDING THE POSSIBILITY OF CRIMINAL PROSECUTION. Entrant agrees to release, discharge, indemnify, defend and hold harmless Gen.XYZ, its parent company, affiliates, subsidiaries, its business partners, prize providers, and promotion and advertising agencies, and directors, officers, employees and agents of any and all of the aforesaid, and any other organizations related to the Sweepstakes, from and against any claim, damages or liability due to any injuries, losses or damages to any person (including death) or property of any kind resulting in whole or in part, directly or indirectly, from receipt, enjoyment, ownership, possession, use, misuse or inability to use any prize, or participation in the Sweepstakes or a related activity, whether under contract, tort (including negligence), warranty or any other applicable sources of law, including, without limitation (i) any condition caused by events beyond Gen.XYZ’s control that may cause the Sweepstakes to be disrupted or corrupted; (ii) any injuries, losses, or damages (compensatory, direct, incidental, consequential or otherwise) of any kind arising in connection with or as a result of the prize, or acceptance, possession, or use of the prize, or from participation in the Sweepstakes; and (iii) any printing or typographical errors in any materials associated with the Sweepstakes. Gen.XYZ shall not be liable for any loss or damage whatsoever which is suffered (including but not limited to indirect or consequential loss) or for death or any personal injury suffered or sustained as consequence of participation in the Sweepstakes or as a consequence of the use and enjoyment of the Prize. IN NO EVENT WILL GEN.XYZ BE LIABLE TO YOU FOR ANY DIRECT, SPECIAL, INCIDENTAL, EXEMPLARY, PUNITIVE OR CONSEQUENTIAL DAMAGES (INCLUDING LOSS OF USE, DATA, BUSINESS OR PROFITS) ARISING OUT OF OR IN CONNECTION WITH YOUR PARTICIPATION IN THE Sweepstakes, WHETHER SUCH LIABILITY ARISES FROM ANY CLAIM BASED UPON CONTRACT, WARRANTY, TORT (INCLUDING NEGLIGENCE), STRICT LIABILITY OR OTHERWISE, AND WHETHER OR NOT GEN.XYZ HAS BEEN ADVISED OF THE POSSIBILITY OF SUCH LOSS OR DAMAGE. Some jurisdictions do not allow the limitation or exclusion of liability for incidental or consequential damages, so the above limitation or exclusion may not apply to you. Gen.XYZ reserves the right to cancel, suspend, modify, or extend the Sweepstakes, if any fraud, technical issue, or other fact that impairs the integrity and functioning of the Sweepstakes occurs, or if necessary to comply with any applicable laws, in connection with the Sweepstakes. If the Sweepstakes is canceled or terminated, XYZ may, in its sole discretion, determine Winners from among all non-suspect, eligible submissions received up to the time of such termination or cancellation, using the judging criteria outlined in Section 7 above. Gen.XYZ assumes no responsibility for any administrative or typographical errors in the course of operating the Sweepstakes or in the Sweepstakes Official Rules or these Sweepstakes Terms and Conditions. Gen.XYZ reserves the right, in its sole discretion, to cancel, modify or suspend the Sweepstakes in whole or in part, in the event of fraud, technical or other difficulties or if the integrity of the Sweepstakes are compromised, without liability to the entrant. Gen.XYZ reserves the right to disqualify any entrant or winner, as determined by Gen.XYZ, in its sole discretion. The Sweepstakes is subject to these Sweepstakes Terms and Conditions and the Sweepstakes Official Rules and all applicable federal, state, provincial and local laws and regulations apply. As stated above, the Sweepstakes is void where prohibited or restricted by law. By participating in the Sweepstakes, you acknowledge that you have read these Sweepstakes Terms and Conditions and the Sweepstakes Official Rules and agree to abide by them and by the decisions of Gen.XYZ, which are final and binding on all matters pertaining to the Sweepstakes. These Sweepstakes Terms and Conditions and the Sweepstakes Official Rules are governed by the law of the State of California, excluding rules governing choice of laws. Except where prohibited by law, as a condition of participating in the Sweepstakes, each Entrant agrees that: (i) any and all disputes and causes of action arising out of or connected with the Sweepstakes, or any prize awarded, shall be resolved individually, without resort to any form of class action, and exclusively by final and binding arbitration under the rules of the American Arbitration Association and held at the AAA regional office located in Los Angeles; (ii) the Federal Arbitration Act shall govern the interpretation, enforcement and all proceedings at such arbitration; and (iii) judgment upon such arbitration award may be entered in any court having jurisdiction. If, for any reason, the above arbitration clause in unenforceable, any action, suit or case arising out of, or in connection with, this Sweepstakes or these Sweepstakes Terms and Conditions or the Sweepstakes Official Rules must be brought in either the federal or state courts in Los Angeles County, California. Gen.XYZ is the official timekeeper for the Sweepstakes.